This Hanging Kitchen Towel is folded over then sewn on the cute little dress that I crocheted. The towel is Blue with Snowflakes on it and the topper is white with Blue trim. 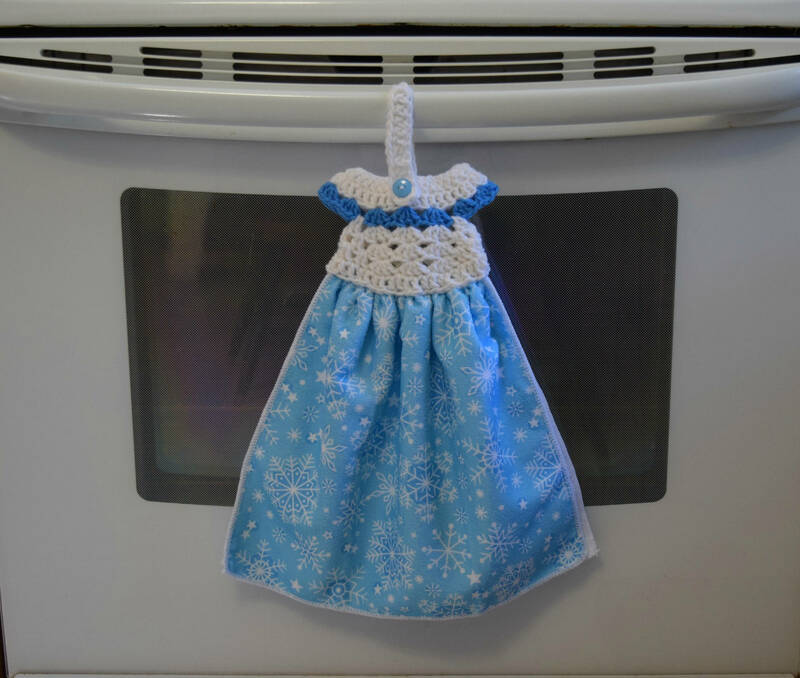 The towel itself is 14 inches wide and 12 inches tall, with the crochet dress it is 18 inches tall. This is the whole towel, not cut in half. The Crochet Topper made with Durable Acrylic Yarn and Towel is Polyester Cloth. These are so different from the other crochet towel topper, cute and unique. You can hang them on the oven door or drawer handle. They make great gifts for housewarmings, bridal showers, Christmas gifts, end of school year gifts, and Mother Day gifts.